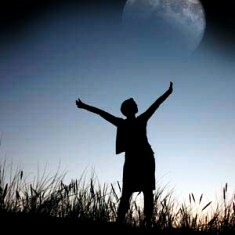 Dharamsala India News.."I Dare to Dream !" Dharamsala India News: Archive No 1, 2009...Click Graphic Above. Dharamsala India News, Kullu,Manali,Shimla,Chamba,Kinnaur & Spiti. India News ! Dharamsala India News: Spring SHOTON & Holi, Dharamsala, 2009, 02nd March, 2009, Dharamsala News. 'Losar' was a quiet affair this year in Dharamsala with silent prayers and candle marches..but, nothing can take the cheer away from the first rush of spring flowers, heralding the 'Shoton Spring Festival' and 'Holi', where we forget all, to just enjoy the warmth of human relationships..spilling forth in various colors of the rainbow ! Several years ago, I lost my mother on Holi Day..her favourite Festival..in Lucknow where we were brought up, Holi is just not about 'colors',..it is about preserving year end white clothes, made vibrant with the first splashes of 'gulal' and water colors..tantalising and teasing human interactions..hot 'ghujias' bursting their seams with 'khoya',..'Dhai Vadas' and ofcourse sour 'Rai Paani' to smoothen the effect of 'Bhaang'! Music is a must..everybody had a song in their heart..semi-drunken poetic confessions of courting hearts,..much was forgiven in good humour ! Evenings sprayed with 'Ittar' (Indian Perfume) and the Indian zephair fragnant with the essence of jasmine buds..my mother always told me, it was important to let your emotions go astray sometimes..to allow those jasmine buds to bloom in your heart, to truely make your life timeless..to do your mistakes and learn from them, rather than not live life at all !! Children playing Hokey-Pokey, 2009 ! Dharamsala News: Himachal Disable Act, Dharamsala, 2009, 26th February, 2009, Dharamsala News. The Himalayan state of Himachal Pradesh has been recognised in the top slot by the Union Ministry of Social Justice, for the best implementation of the persons with disablities act in the country. Dharamsala India News: IIT in Himachal, Dharamsala, 2009, 25th February, 2009, Dharamsala News. The foundation stone for the Indian Institute of Technology was laid at Kamand in Mandi district of Himachal Pradesh in the gracious presence of Shri Anand Sharma, Minister of State for External Affairs and Prof. PK Dhumal, CM of Himachal Pradesh. Himachal, can now look forward to more educational institutions in the near future, thereby increasing the influx of domestic and international students in the Himalayan state. India News: Shiva Ratri, Dharamsala, 2009, 23rd February, 2009, Dharamsala News. The Mahotsav of 'Shiva Ratri', was celebrated all over India will great chanting and singing, regular feasts and prayers. 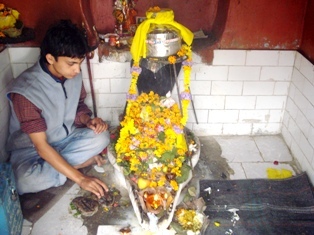 The week long International Shivratri Festival begins in Mandi with the pantheon of Gods and Goddesses blessing this 'Chota Kashi' in the Himalayas of Himachal Pradesh. Dharamsala India News: New Medical College in Mandi, Dharamsala, 2009, 23rd February, 2009, Dharamsala News. The Union Labour Minister Mr Oscar Fernandes and CM of Himachal Pradesh, Prof. PK Dhumal laid the foundation stone for a 500 bedded ESIC Medical College at Mandi for superspeciality medical facilities for the people. The Ministry of Health along with Punjab State Govt. held a health-awareness program in Amritsar giving the people information on good health habits. Dharamsala India News: Awards for Special Olympics, Dharamsala, 2009, 22nd February, 2009, Dharamsala News. This might not be an Oscar journey for us but these children of Himachal Pradesh did the mountain proud by winning several awards at the Winter Games Special Olympics in USA. We wish them more success in the future. 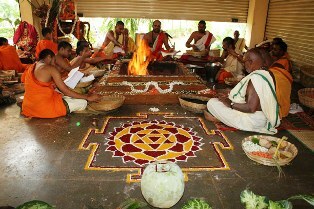 Dharamsala India News: Vedic Chants..A New Lease, 2009, 20th February, 2009, Dharamsala News. The administrative body of the country's richest temple at Tirumala, Andhra Pradesh has decided to admit 'dalit' students in its vedic school in Dharmagiri in Tirumala Hills, abode of Lord Balaji. It will give them a chance for the first time to make priesthood a profession. The Govt. 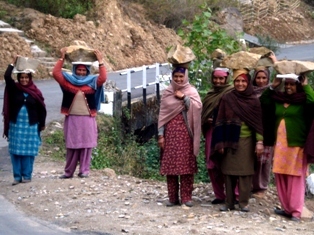 of Himachal Pradesh will be giving priority for jobs to the widows and orphans in the state for deserving candidates. India News: E-Governance Award, Himachal, 2009, 19th February, 2009, Dharamsala News. The Himalayan State of Himachal Pradesh won a twin award for the best 'E-gazette' and HIMPOL (Police portal) in Goa at the national conference for administrative reforms. Cheers to E-Governance where people to Govt contact can be established in Himachal for improving and moniteering the various Govt. Public services. Dharamshala India News: Justice Himachal, 2009, 18th February, 2009, Dharamsala News. A Judiciary which can reach the people is the basis of any democracy. The Chief Justice of India, Shri. K G Balakrishnan while inaugurating the administrative block of the High Court and a judicial complex at Kamnanagar in Himachal, along with the CM of Himachal Pradesh, Prof. PK Dhumal has proposed judiciary reforms in the state by making the discipline easily accessible to the remote regions of the Himalayan state. In Christianity, Buddhism, Hinduism, Sikhism and almost all the religions of the world..giving water to the thirsty, is considered the highest of 'good karmas'. 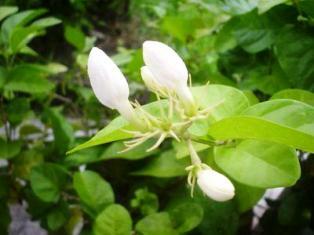 It is our duty as responsible citizens, to contribute in the conservation of water. Do your good karma and save water by using your natural resources like running water nearby and if you are lucky to find underground water in your area then do water-shed management and use it for your daily water needs..do your good deed of the week ! 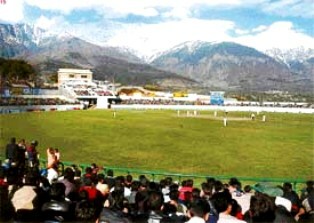 Dharamsala India News:Ranji One Day Cricket Matches, 2009, 15th February, 2009, Dharamsala News. The Ranji Trophy One-Day Knock-Out Tournament - North ZONE will start in the International Cricket stadium of Dharamsala, Himachal Pradesh. Matches will also be held at Una and Pekhubela. With emphasis being laid for developing sports structure, Himachal can look forward to, twelve more sports stadiums in the near future, for an all round promotion of sports in the Himalayas. Dharamsala India News:International Airport in Kashmir, 2009, 14th February, 2009, Dharamsala News. Smt. Sonia Gandhi, Chairperson of UPA Govt. will be inaugurating, the much awaited International airport in the Himalayan state of Jammu & Kashmir. This will greatly facilitate, direct access of the International tourists into the Northern Indian Himalayas, providing a much needed impetus to International Tourism in the mountains. Together with this it would be very helpful in promoting Kashmir, if the state govt. could also formulate a special tourism package, incorporating special travel insurance, for the visiting tourists in the valley, giving them essential travel security. The Himalayas, provide each..a natural haven for Tourism with their scenic beauty, unique culture and should be utilised fully for providing sustainable economy to the country. Dharamsala India News:Marketing the India Himalayas, 2009, 14th February, 2009, Dharamsala News. The Himalayan state of Himachal Pradesh is introducing special familiarisation courses of all the popular sightseeing areas, to the traffic and tourism police of the state. This positive drive, no doubt will create better interaction in helping the visiting tourists..to find their feet around! 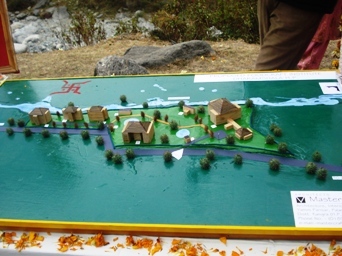 The Power of a Billion People Building INDIA, Vill: Kandi, Dharamsala ! Dharamsala India News: Himachal Gram Seva , 2009, 13th February, 2009, Dharamsala News. In the mountains, the naked eye cannot always see the villages which are tucked away secure in their remoteness and difficult to connect. The Gram Seva Drive is helping building link roads to these villages by the villagers themselves, providing them with employment and connectivity. **Sevagram..The Village of Service ! The village of Shegaon, 08 Kms from Wardha town of Gujrat, became a center of Gandhi's vision of 'village welfare'. The institution grew and with it grew various kinds of economic and social uplift. Many volunteers came to support and teach primary education and promote Gandhi's vision of a self-reliant India, where basic education and economic prosperity was given on the line of self employment. For more on Gandhi India's SEVA-Gram...Click Here !! 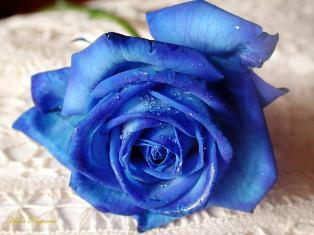 Dharamsala India News: Spl Valentine Blue Rose for Peace ! 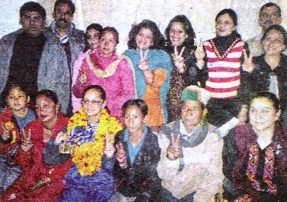 Dharamsala India News: Blue Rose in Himachal , 2009, 12th February, 2009, Dharamsala News. The green valley of Himachal will soon be blooming with the European Blue Rose. 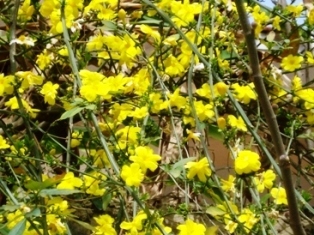 The Horticulture Center in Palampur is developing the breed of 'diostoma', popularly known as the blue rose. Dharamsala India News: Climate Change , 2009, 11th February, 2009, Dharamsala News. "Himachal Pradesh will soon be formulating its own policy on Climate Change for achieving carbon neutrality and environmental protection. It is not discussed in closed chambers, as it is a matter of the environment being a living heritage of the Himalayan state!" ...Prof. Prem Kumar Dhumal, CM Himachal Pradesh at TERI Summit, New Delhi, 2009. The state will be specially looking into irrigation schemes for the arid regions and recycling with limited usage of plastic. Dharamsala India News: Sant Ravi Dass Jayanti..Himalayan Herbal Candle , 2009, 09th February, 2009, Dharamsala News. 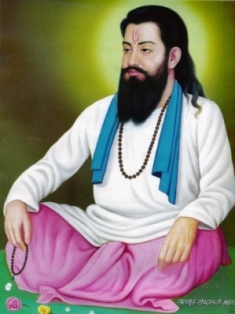 The great Sant Ravi Dass Jayanti was celebrated throughout the country with prayers, arti and singing hyms. His philosophy in life to lead a simple active life disregard to caste, creed or color has inspired many around the world. Soon herbal products of the Chamba Valley of Himachal Predesh..Green Candles, Soap will be exhibited in International Trade Fair to widen the marketing and promote this for the economic sustainability of the village community of Chamba Valley. Dharamsala India News: Get Well Soon, Shri AB Vajpayee, Dharamsala , 2009, 07th February, 2009, Dharamsala News. 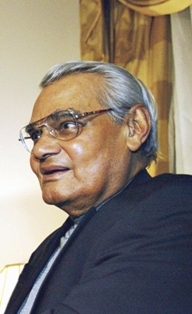 The Himalayan people of Himachal Pradesh wish Shri Atal Bihari Vajpayee, Former Prime Minister of India and also greatly loved for his eloquence in Hindi prose..a speedy recovery and quick recuperation from his chest infection at the Govt. premier Hospital- All India Institute of Medical Science, New Delhi. 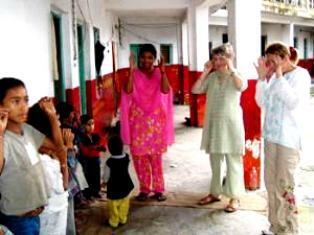 Dharamsala India News: 'Asha', Hope Health Scheme, AIDs Help Dharamsala , 2009, 07th February, 2009, Dharamsala News. The HP Health Dept. will be funding a monthly stipend to about 580 orphaned children, of parents affected with AIDs. Under the central 'ASHA' Health Scheme, the Govt. of India is proposing to station women health officers at 1172 village panchayats across the state. These are the initial first step necessary to provide better upgraded health services in all the villages of Himachal and providing better health care in all the Zonal hospitals. Dharamsala India News: National Food & Craft Institute, Dharamsala , 2009, 05th February, 2009, Dharamsala News. The National Food & Craft Institute was initiated by CM of Himachal, Prof. PK Dhumal and Transport Minister, Shri. 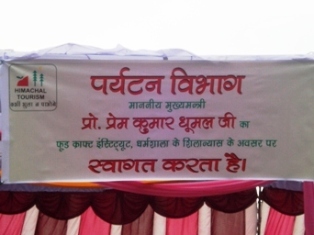 Krishan Kapoor, by laying the foundation stone at Khanyara Village in Dharamsala, Himachal Pradesh, India. This Institute will cater for students from all over India to learn the skills and craft of Food Technology, Food Production, Food and Beverage Services, Housekeeping of the Hotel Management to become the future professionals in Tourism INDIA ! Dharamsala India News: Bridging the Gap , 2009, 04th February, 2009, Dharamsala News. Communication, remains the keyword for bringing on development and change. The Green Chamba Valley, has been recognised for rural development in the villages and best utilisation of the Gram-Udyog Yojna. 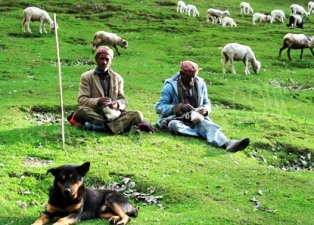 The Himachal State Wool Federation is setting up a special 'help-line' at Shimla, for the shepherds to re-address their problems there. Himachal Govt. is also pursuing the idea of setting up residential schools for the children of the nomadic 'gujjar' tribals, to enable their children to get stable primary education. This endeavour, is important in bringing the 'gujjars' into the mainstream society and enable them to avail the community welfare schemes. Dharamsala India News: Himalayan Mushrooms , 2009, 02nd February, 2009, Dharamsala News. 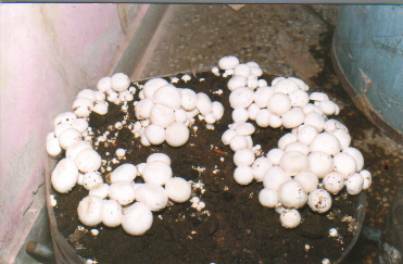 Mushroom farming has gone a long way and with the present Himachal Govt. Policy and initiatives, the production of Himachal mushroom, will get a big boost and will benefit the local farmers economically, with another source of earning of livelihood. Dharamsala India News: Kangra Tea Seminar , 2009, 01st February, 2009, Dharamsala News. 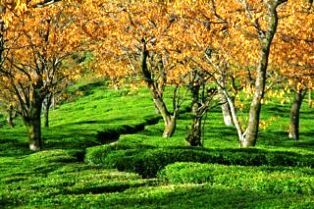 Union Minister of State for Commerce & Industry, Shri Jairam Ramesh and CM of Himachal Pradesh graced the Kangra Tea Seminar in Palampur for Marketing and Production Development of the famous Kangra Tea in Afghanistan, Iran and Egypt for the sustainable economy in the Valley. Dharamsala India News: Corporate Social Responsibility , 2009, 01st February, 2009, Dharamsala News. The Himachal Govt. has requested the Corporate Sector to keep a 5% quota for the physically challenged in order to bring in their social responsibilty into action and help sustain the local economy of the Himalayan state. Dharamsala India News: Himalayan Steel in Kangra , 2009, 31st January, 2009, Dharamsala News. The CM of Himachal with the cooperation of the Union Steel Minister, Shri. 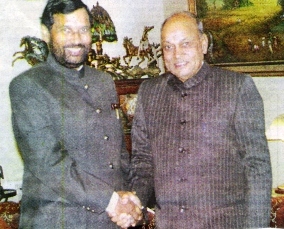 Ram Vilas Paswan will soon lay the foundation of a steel plant in Kangra on 21st Feb, 2009. A major boost to the villagers in the area. 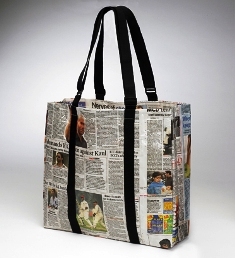 Dharamsala India News: The Sheep Rearers Medical Kit , 2009, 31st January, 2009, Dharamsala News. The Himachal Govt. will distribute the medical kits for the Sheep rearers of the Chamba, Kangra Valley on 02nd Feb, 2009. The problems of the himalayan rearers and local wool producers will be addressed on this occassion. The Urban Development Minister has promised a road from Mcleodganj to Dharamkot Village a popular Tourist region. Dharamsala India News: Chamba Rumal at Commonwealth Games 2010 , 2009, 30th January, 2009, Dharamsala News. 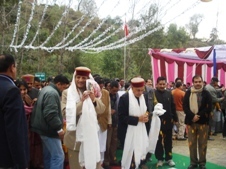 The famous 'Friendship Handkerchief', the Chamba Rumal of the Chamba Valley of Himachal Predesh will see its way to the Commonwealth Games in 2010 in New Delhi, India. 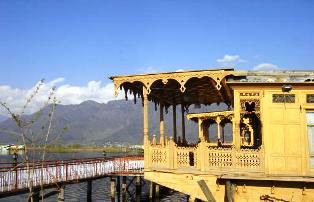 It has an unique texture and weaved by hand in the villages for hundreds of years by the locals. The CM Prof. PK Dhumal has also requested the Union Textile Ministry to iclude the Gaddi sheep and goats in the Integrated Wool Development and Improvement Program - IWDIP so that the tribals benefit by it. Dharamsala India News: NIIT National Painting Competition, 2009, 29th January, 2009, Dharamsala News. 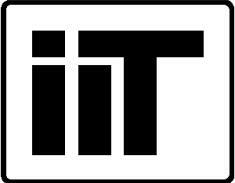 The NIIT Dharamsala organised the National Open Competition in Dharamsala. The children had a fun day with prizes and cultural programs. A Chance to put COLORS to their Dreams !! For more on Dharamsala India News on India Incredible...CLICK HERE ! !